Tan, X., Song, K. and Lu, X. (2018). Enzymatic Activity Assay for Invertase in Synechocystis Cells. Bio-protocol 8(10): e2856. DOI: 10.21769/BioProtoc.2856. Invertase can catalyze the hydrolysis of sucrose, and is widely distributed in cells of cyanobacteria and plants. Being responsible for the first step for sucrose metabolism, invertase plays important physiological roles and its enzymatic activity is frequently needed to be determined. All the methods for determination of the invertase activity are dependent on detection of the glucose product generated by the invertase. Here we describe an ion chromatography based protocol of our laboratory for determination of cyanobacterial intracellular invertase activity. Invertase and sucrose play important physiological roles in cyanobacteria (Curatti, et al., 2008; Kolman et al., 2015) and higher plants (Vargas et al., 2003; Vargas et al., 2010). Invertase (EC 3.2.1.26) can catalyze the sucrose degradation into glucose and fructose. Due to this characteristic of the invertase, any methods which could be used for the determination of glucose or fructose would be theoretically used for the invertase enzymatic activity assay. In fact, most of the invertase enzymatic activity assays are based on the detection of the generated glucose product. Some companies have developed several kits for the invertase activity assay, for instances, ab197005 from abcam (USA), KA1629 from Novus Biologicals (USA), MAK118 from Sigma-Aldrich (USA). By using these kits, the glucose product generated from the invertase reactions would be oxidized and determined by a colorimetric (570 nm) or fluorimetric method (λem/ex = 585/530 nm). In other methods, the amount of reducing sugar liberated by invertase was measured by coupling hexokinase, phosphoglucose isomerase and glucose-6-phosphate dehydrogenase, while the resulting NADPH was further spectrophotometrically determined at 340 nm (Vargas et al., 2003). Ion chromatography could directly detect various sugars including glucose, fructose, sucrose (Du et al., 2013) and glucosylglycerol (Tan et al., 2015). Compared with the spectrophotometer-based methods for sugar determinations, ion chromatography (IC) could be more beneficial for analyzing the enzymatic mixtures containing multiple compounds, especially for the enzymatic assay of cell crude extracts. By using ion chromatography, the sucrose consumption and the glucose production could be shown at the same time in the case of the invertase enzymatic assay, which would provide complete information for the enzymatic assays. Here, we report our recent IC-based protocol for determination of the invertase activity in cyanobacterial cells. Note: Monitor the growth of cyanobacterial cells by measuring the optical density (OD) at 730 nm with a spectrophotometer. Culture volume should be less than 30 ml in 50 ml flasks. Grow Synechocystis cells in 20 ml liquid BG-11 media (see Recipe 1) in 50 ml flasks with an initial OD730 of 0.05. Cultivate the Synechocystis cultures at 30 °C with shaking (150 rpm) and constant white light illumination (50 μE/m2/sec) for ~4 days to reach the exponential growth phase. Collect 8 ml of the exponential phase culture (OD730 ≈ 2) of Synechocystis by centrifugation at 8,000 x g for 10 min at room temperature. Resuspend Synechocystis cells in 0.5 ml of 100 mM potassium phosphate buffer (pH 7.0) in a 2 ml tube. Add 1 g of glass beads (150-212 μm; Sigma-Aldrich) into the 2 ml tube containing cell suspensions and 100 mM Phenylmethanesulfonyl fluoride (PMSF) to reach a final concentration of 1 mM. Then, vortex the tube at the highest speed for 1 min. For each 10 sec vortexing, cool the tube on ice for 5 sec. After centrifugation at 12,000 x g, 4 °C for 30 min, transfer the supernatant into a new tube and store on ice before use. Note: The cell crude extracts should be used immediately. For 50 µl in vitro invertase reactions, mix potassium phosphate buffer (pH 7.0), sucrose and crude extracts together (The final concentrations of potassium phosphate and sucrose are 100 mM and 2 g/L respectively. Whereas, the protein concentrations of crude extracts are 2.5~4.0 g/L.) Use the reaction mixture without the cell crude extract as a negative control. Incubate the mixtures at 30 °C in a thermal cycler (T100, Bio-Rad, USA) for 1.5 h. Then, stop the reaction by three freeze-thaw cycles. In each freeze-thaw cycle, freeze the reaction mixtures in liquid nitrogen and next thaw by incubation in a 65 °C water bath. Measure the amount of the resulting glucose and fructose as well as the rest of the sucrose substrate using ion chromatography (Figure 1). Spin down the reaction mixtures at 12,000 x g for 10 sec. Then, subject 25 μl of the diluted mixtures to ICS-5000+ ion-exchange chromatography system equipped with an electrochemical detector and a DionexTM CarboPacTM PA10 analytical column (4 x 250 mm, ThermoFisher, Waltham, MA, USA). Elute the column with 200 mM NaOH at a flow rate of 1.0 ml/min. Note: The reaction mixtures should be diluted to at least 50 folds before analyzed by ion chromatography. Prepare a series of glucose standard solutions (0.01, 0.05, 0.1, 0.5, 1, 2 mg/L), establish the standard curve by using ion chromatography (see below). Retention times of glucose and fructose using the method described above are 3.5 and 3.8 min respectively (Figure 1). 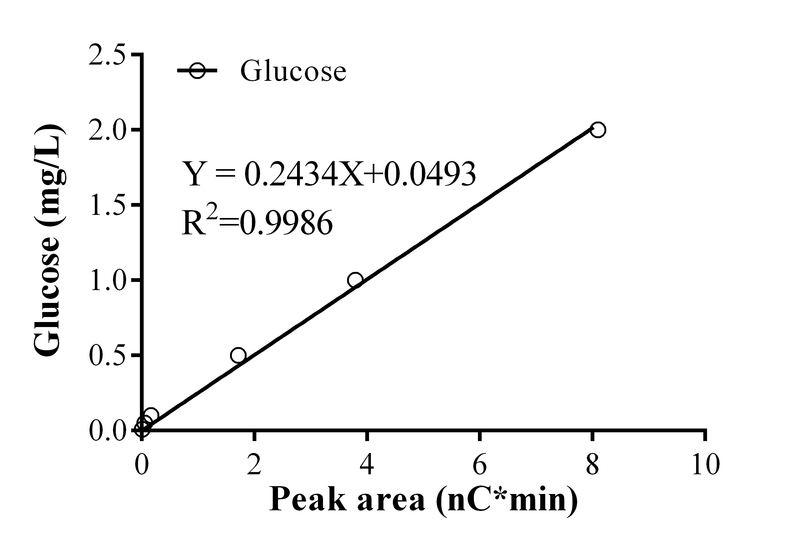 Establish the glucose standard curve by using the peak area calculated by the Chromeleon software (Figure 2). Figure 1. 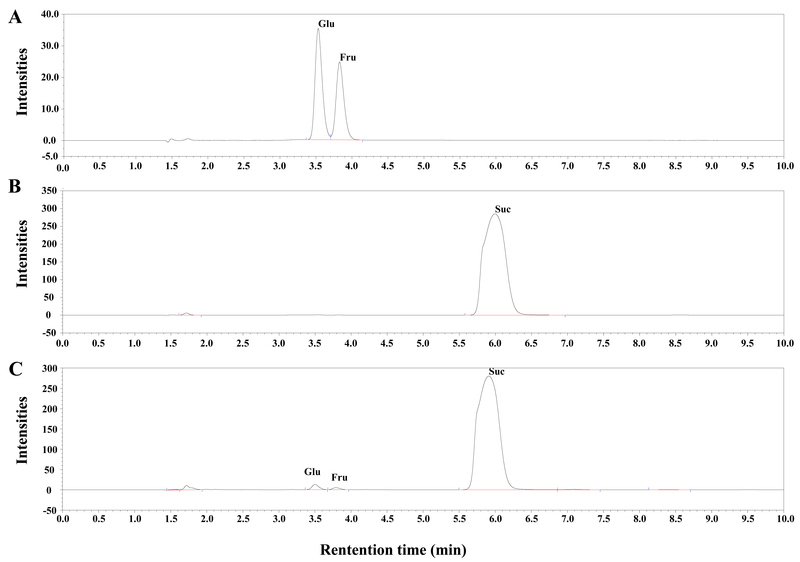 Ion chromatography profiles of standards and the in vitro invertase reaction mixtures. A. Chromatogram of the glucose-fructose standard mixture. 100 mg/L of the glucose and fructose standards were mixed together and analyzed by ion chromatography. B. Chromatogram of the in vitro invertase reaction mixture without the cell crude extract (negative control). C. Chromatogram of the in vitro invertase reaction mixture. Glu, Glucose; Fru, Fructose; Suc, Sucrose. For quantification of glucose in reaction mixtures, calculate the areas of the target peak obtained by ion chromatography by the Chromeleon software, and then determine the glucose concentration using the standard curve of the glucose standards (Figure 2). Cprotein, the protein concentration of the cell crude extract, unit: mg/L. This work was supported by the National Science Fund for Distinguished Young Scholars of China (31525002 to X. Lu), Shandong Key basic Research project (ZR2017ZB0211), the Joint Sino-German Research Project (grant GZ 984 to X. Lu), the Shandong Taishan Scholarship (X. Lu), the National Science Foundation of China (31301018 to X. Tan), the Key Research Program of the Chinese Academy of Sciences (ZDRW-ZS-2016-3 to X. Tan) and Qingdao Innovative Leading Talent (15-10-3-15-(31)-zch). Curatti, L., Giarrocco, L. E., Cumino, A. C. and Salerno, G. L. (2008). Sucrose synthase is involved in the conversion of sucrose to polysaccharides in filamentous nitrogen-fixing cyanobacteria. Planta 228(4): 617-625. Du, W., Liang, F., Duan, Y., Tan, X. and Lu, X. (2013). Exploring the photosynthetic production capacity of sucrose by cyanobacteria. Metab Eng 19: 17-25. Kolman, M. A., Nishi, C. N., Perez-Cenci, M. and Salerno, G. L. (2015). Sucrose in cyanobacteria: from a salt-response molecule to play a key role in nitrogen fixation. Life (Basel) 5(1): 102-126. Rippka, R., Deruelles, J., Waterbury, J. B., Herdman, M., Stanier, R. Y. (1979). Generic assignments, strain histories and properties of pure cultures of cyanobacteria. J Gen Microbiol 111(1):1-61. Tan, X., Yao, L., Gao, Q., Wang, W., Qi, F. and Lu, X. (2011). Photosynthesis driven conversion of carbon dioxide to fatty alcohols and hydrocarbons in cyanobacteria. Metab Eng 13(2): 169-176. Tan, X., Du, W. and Lu, X. (2015). Photosynthetic and extracellular production of glucosylglycerol by genetically engineered and gel-encapsulated cyanobacteria. Appl Microbiol Biotechnol 99(5): 2147-2154. Vargas, W., Cumino, A. and Salerno, G. L. (2003). Cyanobacterial alkaline/neutral invertases. Origin of sucrose hydrolysis in the plant cytosol? Planta 216(6): 951-960. Vargas, W. A. and Salerno, G. L. (2010). The Cinderella story of sucrose hydrolysis: Alkaline/neutral invertases, from cyanobacteria to unforeseen roles in plant cytosol and organelles. Plant Sci 178(1):1-8. How to cite: Tan, X., Song, K. and Lu, X. (2018). Enzymatic Activity Assay for Invertase in Synechocystis Cells. Bio-protocol 8(10): e2856. DOI: 10.21769/BioProtoc.2856.